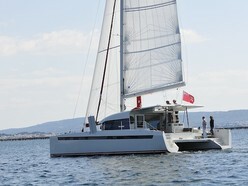 Stunning, high-performance catamaran intended for offshore cruising and specified with only premium equipment as standard. Construction is glass / carbon epoxy over a foam core. 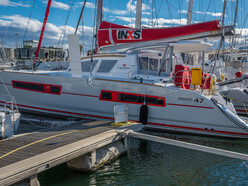 Carbon mast and boom by NORDIC MASTS with textile Kevlar rigging. Full suite of INCIDENCES sails including main, genoa, solent in Hydranet and screecher. Very low engine hours (1600 hours) on twin YANMAR 75 HP engines with folding props. New navigation electronics. The interior is modern-understated and very elegant featuring teak veneers, alcantara liners, corian countertops, and designer lighting and bathroom fixtures. Very generous headroom throughout.